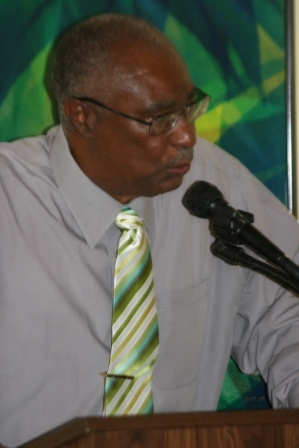 (Charlestown, Nevis–Wednesday, March 9th, 2011) A number of students of the Nevis Sixth Form College said that Training and Education was of major concern to them. 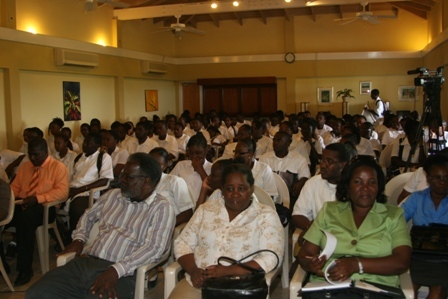 The students made the comment during a meeting with the Premier of Nevis, the Hon. Joseph Parry and his Nevis Island Cabinet on Monday at the Mount Nevis Hotel. The young people were afforded the opportunity to dialogue with the Premier and his Cabinet following a luncheon hosted by the Premier’s Ministry. During the meeting, a young male student stated that he appreciated all the assistance that the Government had given to those interested in tertiary education and inquired how one qualified to receive financial assistance? In response the Premier outlined some of the methods including good grades in the Sixth Form CAPE exams, seeking higher education in Agriculture, Health or any other areas in which Government had needs and attaining five basic CXC subjects could grant a young person financial assistance. Mr. Parry also exclaimed that he is very proud to say, that about 170 students had received assistance to pursue higher education. The Deputy Premier and Minister responsible for Youth, Hon. Hensley Daniel, informed the young people that over the past four years, 35 young people had been afforded the opportunity for training in masonry, carpentry and plumbing in Trinidad, four had received training in Norway and 13 were sent to St. Lucia for Training in Business Management. Another male student then asked about alternative energy and the likelihood of training opportunities and higher education available to pursue studies related to geothermal energy. The Minister of Communications, Works and Utilities, Hon. Carlisle Powell responded that a number of Nevisian students were at present studying Geothermal Energy in El Salvador and then will further their training in Iceland. Mr. Powell also noted that the Nevis Island Administration had negotiated with the proper authorities in Iceland to grant scholarships to students seeking a Masters Degree in Geothermal Energy.